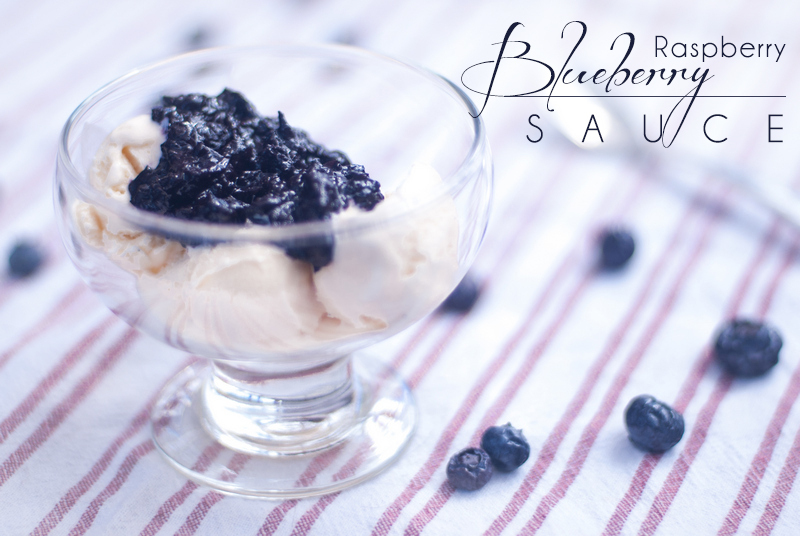 Blueberries: they're healthy, tasty, and versatile, much like this Blueberry Raspberry Sauce! This sauce is good on all of the things: chicken, pork, waffles, ice cream, etc., etc., etc. 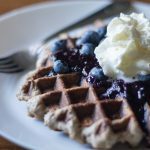 *This post has been sponsored by BC Blueberries, which is cool 'cause we love to eat and support local growers! Whoa!!! Blueberries are already in season! I think blueberries are one of the coolest fruits because they look cool, taste amazing, are so versatile, and freeze so well (and are great even eaten frozen) which means you can enjoy them year-round. And their color! Because I don't have kids, I don't have to worry about little blue hand prints all over everything, so it's easy to really enjoy the color, hahaha. Aren't blueberry smoothies and cocktails gorgeous? We're actually working on a blueberry vodka right now. Well, I missed out on a cool event with a bunch of Vancouver-based food bloggers and BC Blueberries last weekend: blueberry picking! There's something about getting out in the plants and soil, and connecting with the source of our food that nourishes the soul, don't you think? There are a lot of “U-Pick” fruit places where I live, yet I haven't picked them myself in years. If you hit one up this summer, please tag us and BC Blueberries (@theprimaldesire and @bcblueberries) so we can enjoy too! 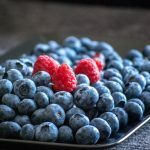 The BC Blueberries Council emphasizes on their website all the health benefits of blueberries, “nature's candy”, being crammed full of antioxidants, which have been associated with preventing and helping diabetes, heart disease, strokes, Alzheimer's and Parkinson's diseases. You see? Eating real food is good for you (and fun for your mouth). 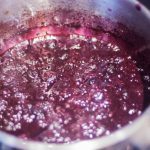 Blueberry Raspberry Sauce for chicken, pork, ice cream, waffles, pancakes, baked brie and crackers, licking off your kid's hand and the walls – however you choose to use it, and no matter what time of year, just enjoy it and make it your own! This Blueberry Raspberry Sauce is good on ALL OF THE THINGS, such as chicken, pork, ice cream, baked brie, turkey, waffles, etc., etc., etc. Combine all ingredients with 1/2 cup water into saucepan over medium to medium-high heat and cover. Let berries soften and gently for 10 min stirring periodically. Add more water if sauce gets too thick at any point (don't worry we can always boil off the extra at the end). Try to mash as many of the berries as you can to release their juices. Remove from heat and mix well. At this point I used a potato masher to crush and mix the berries. If the sauce is too thin and runny, return to heat until desired thickness. And be sure to scrape the thick stuff off of the sides of the pot: that's all concentrated flavor that you don't want to lose! 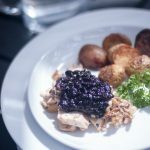 Taste and adjust flavors: This sauce should really highlight the flavor of the berries themselves: naturally sweet with a touch of sour. If you have a sweet tooth, you put in too much salt, or your berries are too tart, add some maple syrup or honey as needed. 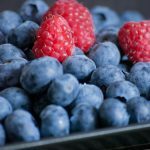 Keep in mind that your berry flavors will vary, so it's important that you test the sauce at the end to ensure it is what you like. This recipe sounds delicious. I can’t wait to try it with ice cream! You guys keep impressing and inspiring me! Looks delicious I love blueberries, in fact I buy a years worth from my local farmer who grows organic berries, freeze them and have about a cup everyday as my “dessert”. They are so good! I have a turkey breast I am going to grill tomorrow, I think I will also add some cranberries to this fruit medley and have it as the topping! Thanks for the awesome ideas! Ahhh Aimee, you’re the best. So glad that we can be a part of inspiring you! Also, I have made this with cranberries instead of raspberries. They work great too. Lovely combination. It’s funny, I love both fruits individually but seldom combine them. I’ll have to rethink that! No fruit salads in your life? I basically wanted to add some tartness from the raspberries (or cranberries as Aimee mentioned) just to give it a little more depth. I was also thinking about adding herbs like rosemary to the sauce. Delicious. 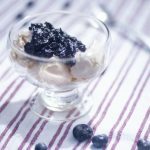 Whenever I think of blueberry sauce, my mind automatically goes to a delicious slice of plain cheesecake ladled with blueberry sauce. And it just so happens that I have three slices leftover in my freezer from this past weekend….it’s blueberry time! 🙂 Thanks for the recipe! That’s my weakness right there! Do you have an extra piece for me? I love how thick and versatile it is! 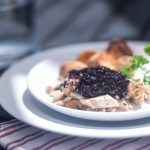 I have always love cooked berries with pork. YUM! I’m kinda craving waffles now! You know it’s a good thing when the title includes ‘chicken, pork, ice cream, etc.’ I love the versatility here!!! LOL, yeah… That’s like our fenugreek sauce: still haven’t found anything that it isn’t awesome on. Meat, veg, watermelon, you name it! Ohhhh that sauce on ice cream sounds PERFECT for summer! Oh gosh I would definitely put this on all the things!!! My kids will love this – thank you! This looks so good, and I love how versatile it is, it sounds equally fantastic over ice cream or chicken! This is so simple and looks so delicious ! Thank you for sharing ! What a great recipe – so simple but so tasty and so many applications for use! Love this.